Recent roles for Furman include Don José in Carmen (Springfield Regional Opera), Tito in Mozart’s La clemenza di Tito (Opera Company of Brooklyn), and Camille in The Merry Widow (Muddy River Opera). A graduate of the University of Cincinnati College-Conservatory of Music and Western Illinois University, Furman is a former young artist with Cincinnati Opera and Opera Omaha. He sang his first Wagner role in 2010, as Augustin Moser in Cincinnati Opera’s Die Meistersinger von Nürnberg, and last year sang a concert of music from Wagner’s Ring with Kentucky Symphony Orchestra. We hope to check in with Furman this coming week. For now, let's hear from former Seattle Opera Young Artist Marcy Stonikas, who today makes her second big role debut with us this season: two months ago she sang her first Turandot on our stage. Welcome back! Before we talk about Fidelio, let’s go back to Turandot. How was that experience for you? It was awesome. I had a really wonderful time, and loved every minute of it. It’s not very often you get to watch an opera you’re actually in, and I got a lot of experience watching it. I think that probably informed my own performance a lot, because I got to see everybody else’s mojo going on, and then got a really good sense of the big picture, so I was able to figure out how I fit into that puzzle. Turandot was a huge, beautiful, awesome-looking thing and it was really cool to be part of it. 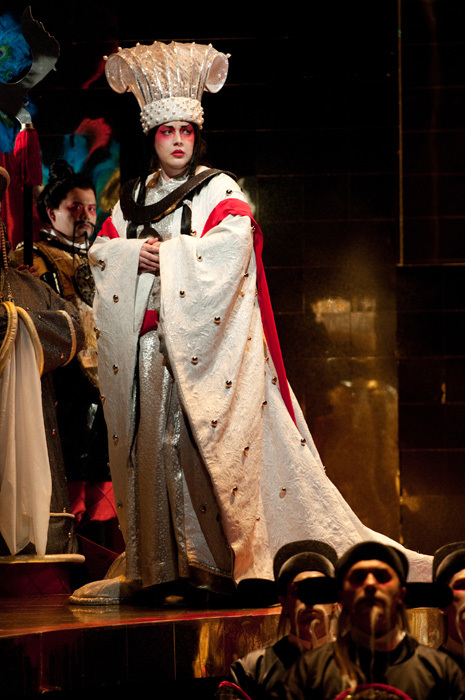 Marcy Stonikas as Turandot in Seattle Opera's production this summer. Now, in Fidelio, you get the challenge of portraying a woman pretending to be a man. Have you ever performed a role in drag before? I did a student-written opera when I was in undergrad at Oberlin, in which everyone was in drag. All the guys were women, and all the women were men. It was a very short and small opera, but I remember distinctly that I had even penciled on a mustache or something, and no one had any idea I was a female until I started singing, and then I watched every head go woosh! How has the rehearsal process for Fidelio been? It’s been great. 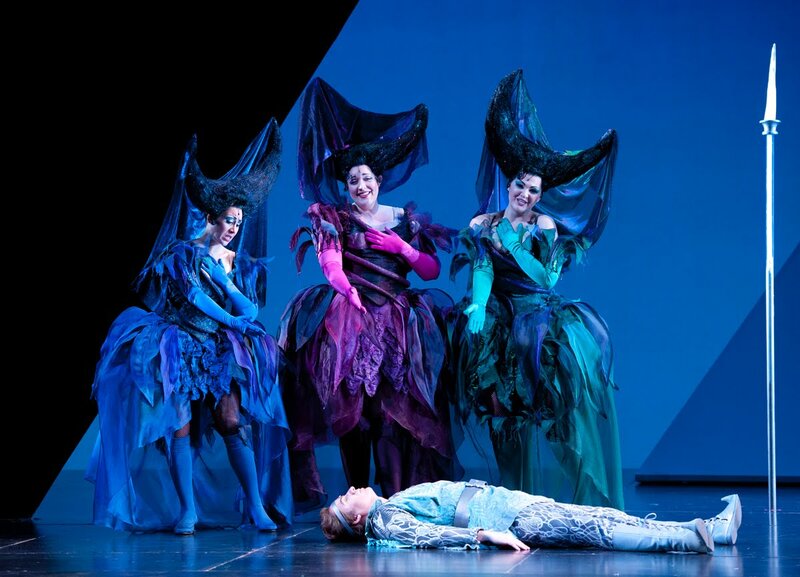 I’ve worked with Stage Director Chris Alexander before [in 2011’s The Magic Flute], and I’ve worked with Conductor Asher Fisch because he conducted Turandot, so I felt comfortable coming into this situation. 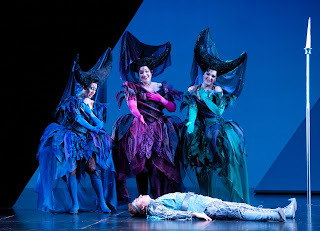 Anya Matanovič (left) as the First Lady, Marcy Stonikas (center) as the Second Lady, Lindsey Anderson (right) as the Third Lady, and John Tessier (on the ground) as Tamino in 2011's The Magic Flute. Three of these singers are reunited in Fidelio: Matanovič sings Marzelline, Stonikas sings Leonore on October 14, and Tessier sings Jaquino. In some ways, Leonore is bachelor Beethoven’s fantasy of the ultimate woman/perfect wife, instead of a well-drawn fictional character. Do you find her three dimensional? I definitely think there are realistic traits to her, but I have to agree to a certain extent with your statement, because I told my husband I feel like Fidelio is a Disney movie. It’s all sad and filled with tension and conflict and then there's a happy glowing storybook ending at the end. But as far as Leonore goes, I would hazard to guess she is what every wife wants to be. Or maybe that’s just me; I would love to be perfect. I would love to think that if my husband were gone for two years, I wouldn’t just sit back and think that he was gone or that he’d left me or that he died, and that I would go out and find him. But I don’t know. It makes me think of Castaway with Tom Hanks. Helen Hunt’s character goes on and gets married again, because he’s been gone for so long. That’s sad. You want to believe that you’d wait and have that happy reunion. I guess you never know ‘til you’re in that sort of situation yourself. It’s often pointed out by many people that this is a tough role to sing. Have you found that to be true? Yes, I definitely think that’s true. I have moments of panic here and there, because the second act, except for Florestan’s aria in the beginning, has Leonore on stage for the entire time. And she’s singing the entire time, pretty much. And I’ll think, “Oh my gosh, I have to make it through this song and then I have to go into this other song right after! What am I going to do? !” But it’s all about pacing yourself, and that’s something you have to do in general when you sing the kind of rep that this is. When you sing any Wagner, Verdi, Strauss, any long operas, these are things that you run into. 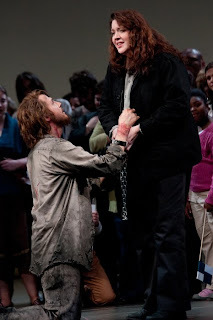 Ric Furman (Florestan) and Marcy Stonikas (Leonore) sing the Sunday matinee of Fidelio on October 14. 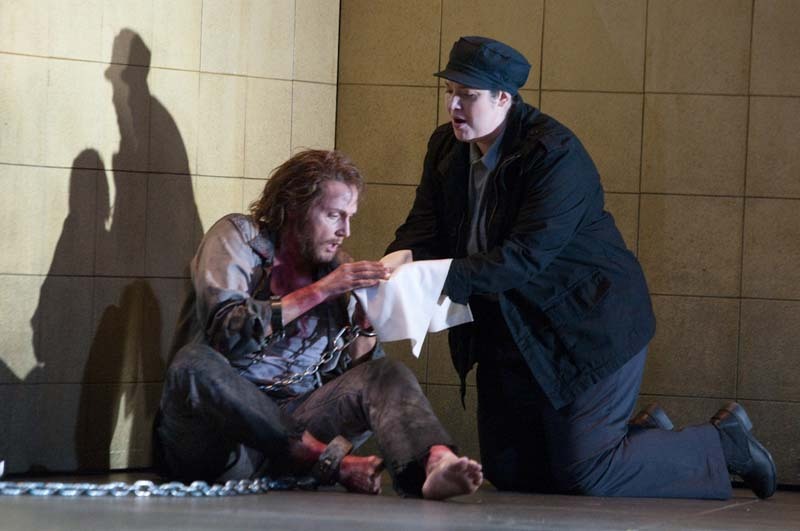 Do you have a favorite moment in Fidelio? I really love the music in my first number, the quartet. It’s really brilliantly woven. It starts with Marzelline and then Leonore gets added in and then Rocco gets added in and then Jaquino gets added in. And it’s just really Beethoven. It’s really simple but beautiful and I think it’s touching every time. So far, that’s my favorite. We also know you have a one-year-old son named Henry; do you ever find yourself singing to him? I do! I sing lullabies to him, predominantly, like kid songs you probably got sung as well. What’s interesting is you have to remember those songs after so many years and that’s hard! My mom came to visit and she sang a song to him that I’d forgotten she used to sing to me, and it was one of my favorites, so now it’s in my repertoire. [Laughs] We have our lullaby repertoire, and he also likes nursery rhymes. Is he an opera fan yet? As far as opera goes, he heard five operas in utero, because I was in five shows while I was pregnant—which is crazy when I think back on it. So he’s pretty attentive, actually, when I sing, but I think I’m really loud in general, and I think sometimes I’m shockingly loud to him. He puts his head on my chest so he’s below my mouth, and then I’ll put my hand on his other ear, so he can hear the vibrations. I think he likes that; it’s probably similar to what it was like in the womb. I was at Wolf Trap this summer and there was a bass that would carry him around and hum, and Henry would nuzzle up to him, he loved hearing the bass. 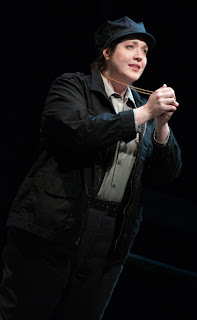 Marcy Stonikas as Leonore in Seattle Opera's current production of Fidelio. Sounds like he might wind up being a musician himself. I know, but I kind of hope he doesn’t. Obviously, I want him to be a good musician—but I also hope he doesn’t choose it as a career. Lord help him! It’s so hard! But I just want him to be happy. And my husband is an actor, so he’s doomed. Maybe he’ll rebel and become a botanist.